Here’s my way of memorizing kanji. It is based on my experience of learning Japanese writing for around 1 year. I always tweak it from time to time. Choose a batch of kanji to memorize. For example, I’m now memorizing grade 3 jouyou kanji (200 kanji). Some other examples are all kanji in a specific Japanese Wikipedia article and all kanji in a Japanese song. Making a list reduces the sense of being overwhelmed by the gigantic amount of kanji one needs to master Japanese, while at the same time creating a challenging target to accomplish. If the list is too large (like my current case), break it into more managable chunks. For example, I pick at least 10 kanji (from the total 200) to learn everyday. To give a concrete example, let’s suppose I’m rying to memorize 光. For 光 I can choose the reading ひかり (hikari) with the meaning “light”. Another possibility is 光る which reads ひかる (hikaru) and means “to shine”. Note that some kanji cannot stand by itself, which means that it needs okurigana (hiragana suffixes) like 暑い (あつい, atsui, hot) or appears in a compound like the 曜 in 日曜日 (にちようび, nichiyoubi, Sunday). When the kanji only appears in compound and I doubt about its meaning, I take a look at the kanji dictionary KANJIDIC. KANJIDIC has information about associated meanings for a kanji. Again, dictionaries like Wakan and JquickTrans use KANJIDIC for its kanji data. I eat my own dogfood, using SharpJiten to do it. For example, the 曜 mentioned before has the meaning “weekday” associated with it. PS: As a side note, “weekday” means any day of the week except Saturday and Sunday. However, the kanji 曜 is used in both Saturday (土曜日) and Sunday (日曜日). 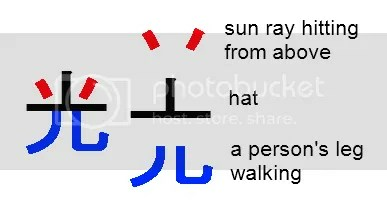 and assign the mnemonic “he walks (儿) with a hat (亠) to protect himself from the LIGHT of the sun ray (\ /)”. This is a creative process which is limited only by imagination (see other examples here). The weirder, funnier, and more personal the mnemonic is, the easier it will be to remember. After creating a mnemonic, I write it in a computer file for future reference. This is obviously useful when I forget the mnemonic. When you have memorized lots of kanji and radical (shapes occuring in various kanji, like 广), memorizing new kanji will be a lot easier. This is because many kanji are just a mix and match of other kanji and/or radical. Some examples are the kanji 明 (bright) (mix and match of 日 (sun) and 月 (moon)) and 線 (line) (mix and match of 糸 (thread), 白 (white), and 水 (water)). Making a mnemonic will then be only about making a sentence out of those well-known shapes. An example is “the sun (日) and the moon (月) are both visible on the sky so it is very BRIGHT (明) today”. Next is to make a mnemonic to associate the sound to its meaning. 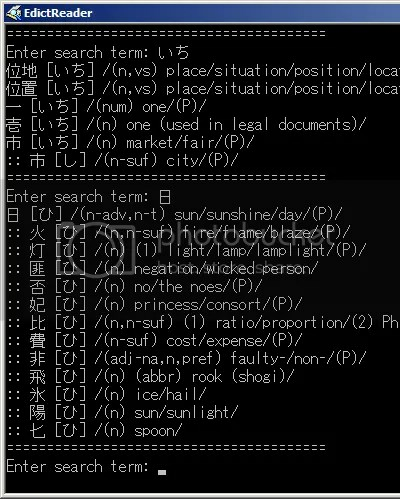 Here’s an example for ひかり (hikari, light). In English, ひ (hi) is read like “he” and かり (kari) sounds somewhat like “curry”. So one possible mnemonic is (he (HI) cooks curry (KARI) by exposing it to sun LIGHT). I also archive the mnemonic in a computer file. 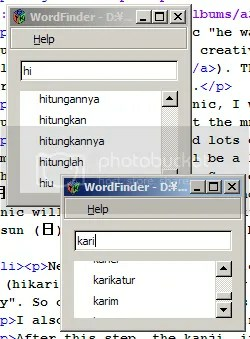 Then I see see the stroke order using my program StrokeReplayer (data from Taka and KanjiCafe). Then I scribe the correct stroke order in my stroke order reference book (the usual tree-killing book, not a a digital thing). I then try to "feel" the flow of the strokes by writing the kanji several times in my practice book. When I encounter a writing question, I write it on the canvas of StrokeReplayer and compare it with the correct answer there also. Is all the mnemonics really that useful? I can ascertain that it works great! When I can’t instantly recall a shape, word, or meaning, mnemonic allows me to rediscover it. When I’ve become familiar enough with the item, I won’t consciously use the mnemonic so it certainly isn’t a hindrance to instant recall. Kanji and word dump: grade 3 start! I’ve finished writing the stroke order of all grade 1 and 2 kanji on my new reference book. I’ve also added the corresponding StrokeReplayer entries on Mnemosyne. I’m now I’m memorizing grade 3 kanji with the new infrastructure. The word count is now 1579. In MS Gothic, the blue stroke is a horizontal mirror of the red one. In the image above, MS Gothic and MS Mincho agree on stroke concavity. All those examples suggest that concavity is up to the preference of the writer. MS Mincho’s style can be said to showcase wabi sabi more (wabi sabi is a Japanese view that states beauty is found in asymmetry and imperfection). However, even on the same font there are variations for some shape. I’ll illustrate MS Gothic’s case. The first is regarding the red stroke in the 木 shape. In the top row, all of them are concave up. In the second row, where the shape appears on the half left of a “horizontal flow layout”, it is concave down and slightly displaced below. Appearing by itself, the blue stroke is unconnected to any other stroke and the red stroke is connected to the lowermost stroke. For the 2 kanji to the right of the first one, the stroke corresponding to the red one is connected to the top horizontal stroke also. For the last kanji, all of them are connected to the top and bottom horizontal strokes. In the last kanji, the red stroke is concave down, different from the first two. In the top row, the lowermost horizontal stroke is… well… horizontal. However, in the bottom row, where 土 appears in the left side of a horizontal flow layout, the lowermost stroke has a positive slope. There are many more examples that I found. Because some variation rules can be found, it casts doubt that the stroke detail (concavity, connectivity, slope, etc) is completely up to the writer. Whatever the case is, all those variations makes the task of memorizing the shape harder for anyone who want to follow the style of MS Gothic (or Mincho) as close as possible. This post has been moved to singularity.agronesia.net: “Memorizing kanji stroke order: Mnemosyne + StrokeReplayer”. Please visit the new server.